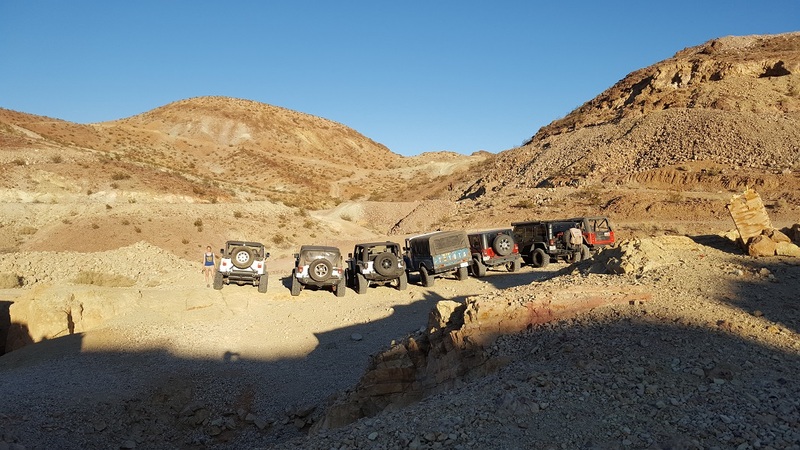 Doran Canyon of the Odessa / Doran Loop of the Mojave Desert is one of the most difficult rock crawling off-road trails near Barstow California next to the Calico Ghost Town. 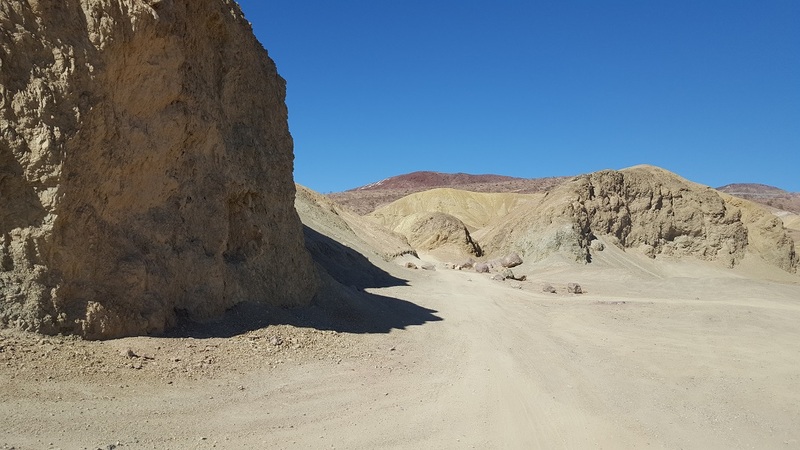 When traveling this area, you will notice that the mostly desert landscape is very different than its counterpart Odessa Canyon. 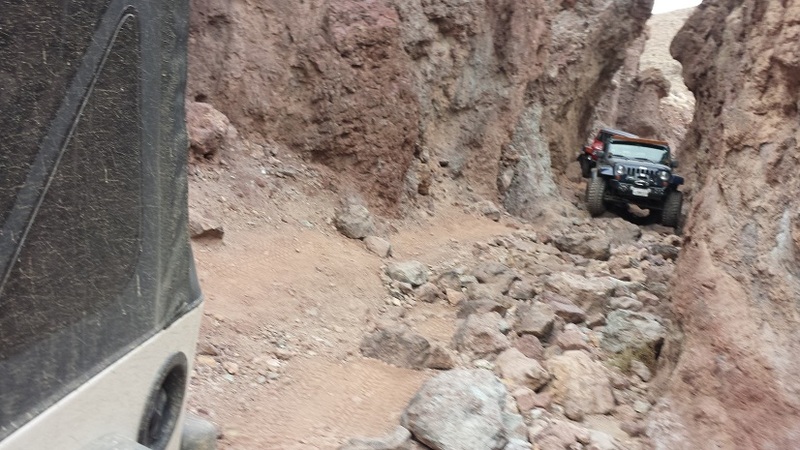 Even though these two offroad trails are near the same in difficulty throughout the main body of the trail. 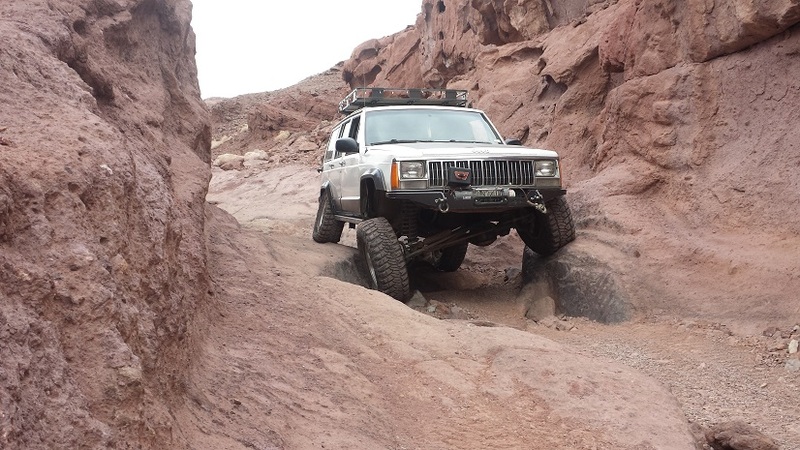 Doran has one big difference when it comes to the trail drive, that is "Doran Gate Keeper". 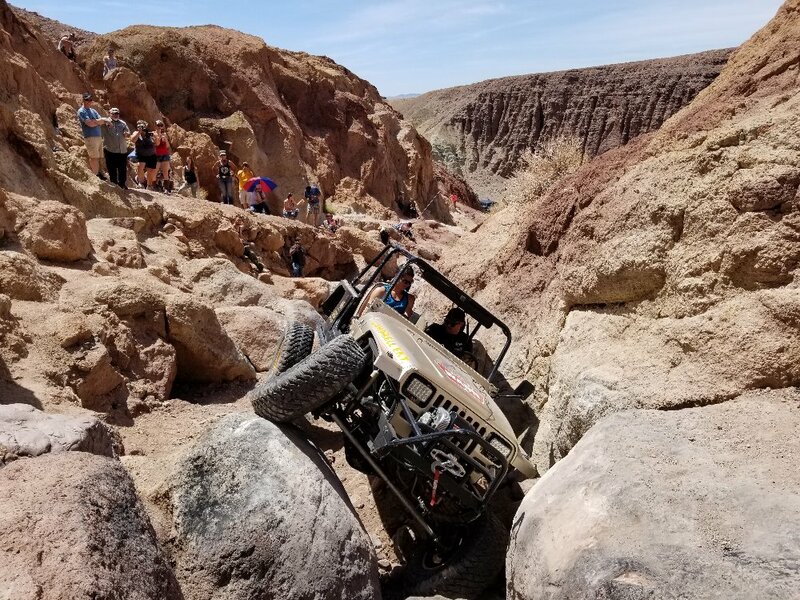 Doran's GateKeeper is an insanely difficult off-road obstacle with rocks larger than your vehicle. 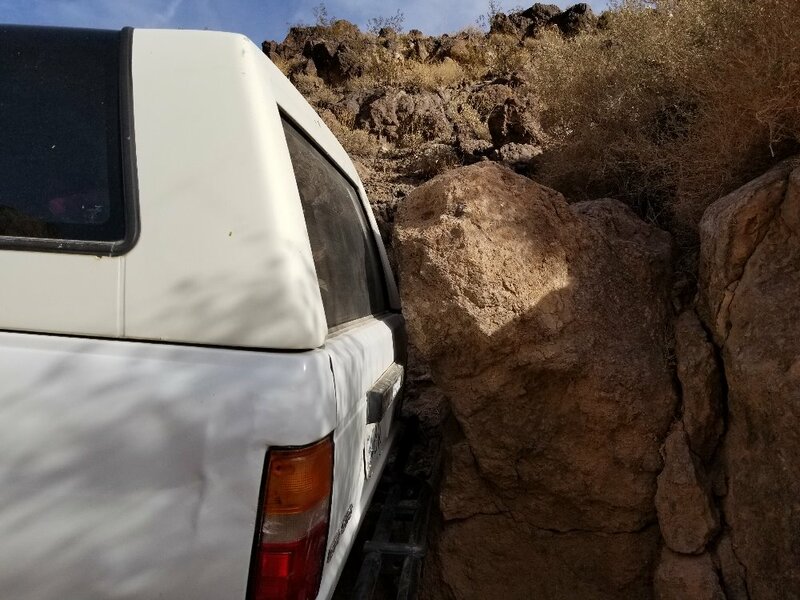 The holes between the rocks are so large that it is common for people to put their vehicle on its side between the rocks. 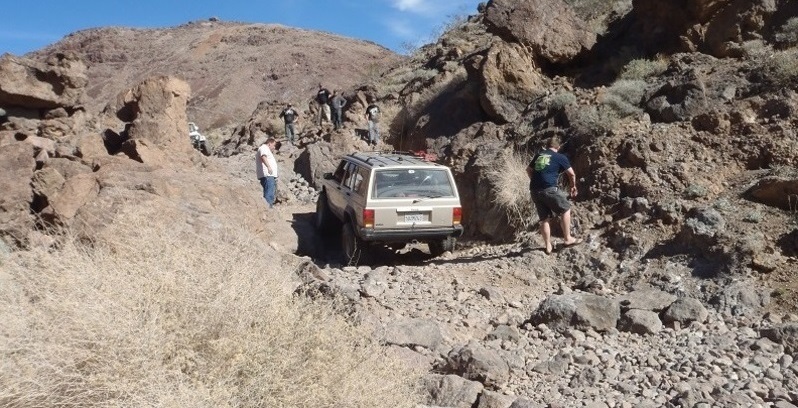 It's a spectacle to watch extreme off-road enthusiasts try this legendary obstacle as the rocks look like they are swallowing the vehicle whole. 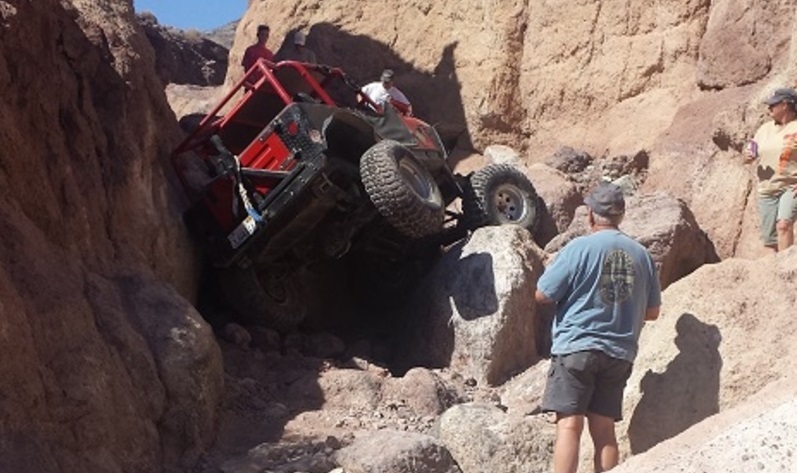 It is common for a Jeep Wrangler or Toyota to disappear in the gap only to receive massive body damage when trying to recover the vehicle out of the holes. 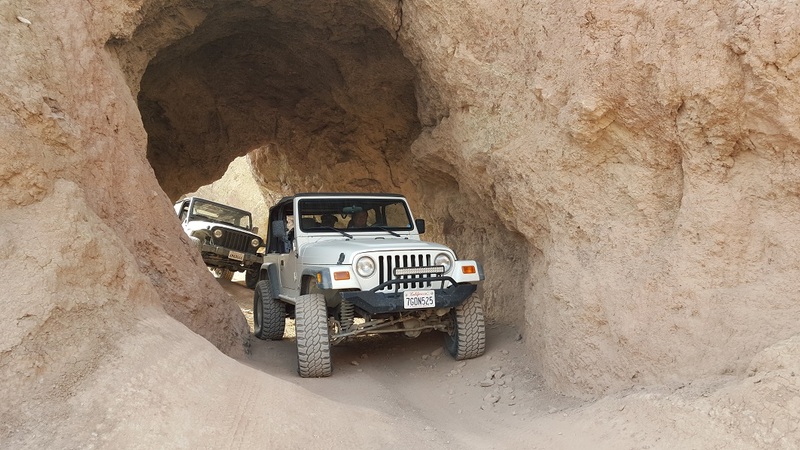 But the rest of the trail is no walk in the park, with several large waterfalls and many off-camber tight areas, Doran Canyon will test your driving skills and vehicle to its limits. Rocky or undulated road surface. Rocks more than 10' tall. Vertical ledges more than 8' tall and/or near vertical ledges or waterfalls more than 18' foot. Poor tire placement. Extreme steepness and/or off-camber. 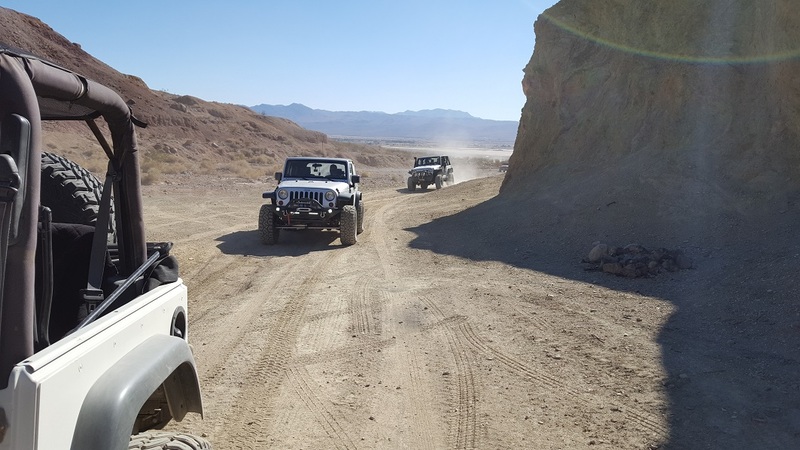 Doran Canyon is a rock crawling trail for the experienced drivers with built rigs. 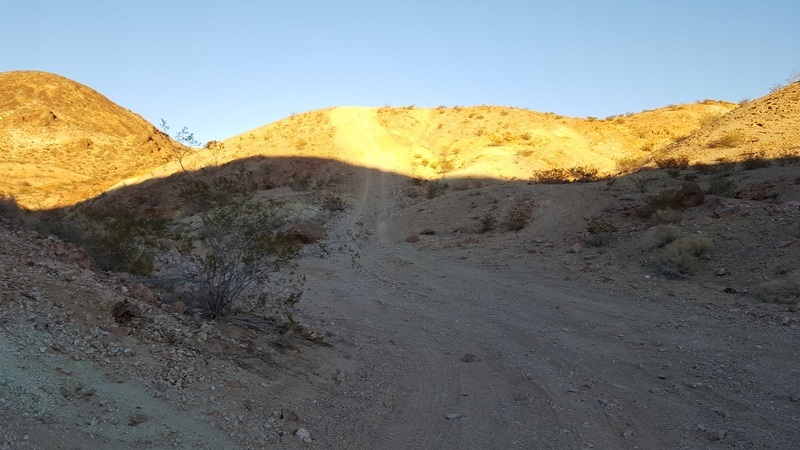 The trail offers a 6-foot waterfall, a narrow off-camber canyon just wider than your Jeep, and the hardest obstacle in the area... Doran Canyon's GateKeeper. Which is easy a 10 rated obstacle at the lower end of the trail but this obstacle does have a bypass around it. 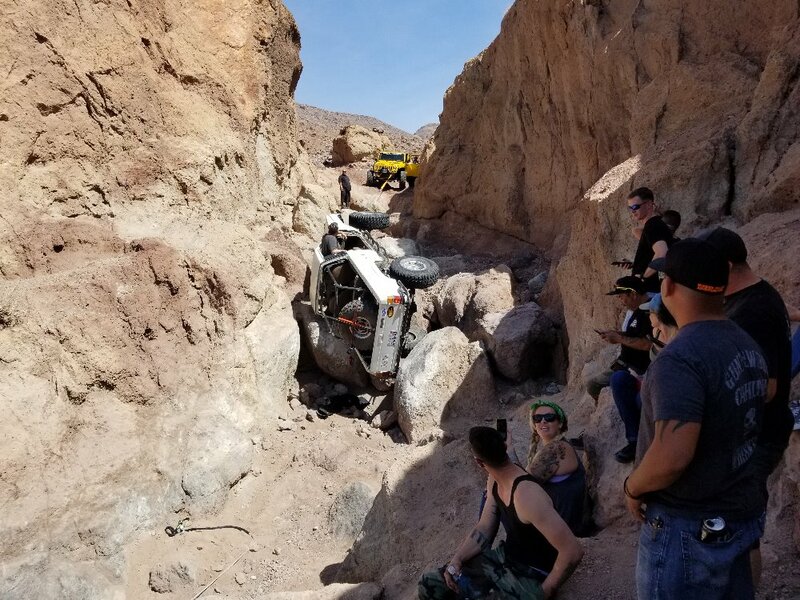 There is no right vehicle for Doran Canyon. 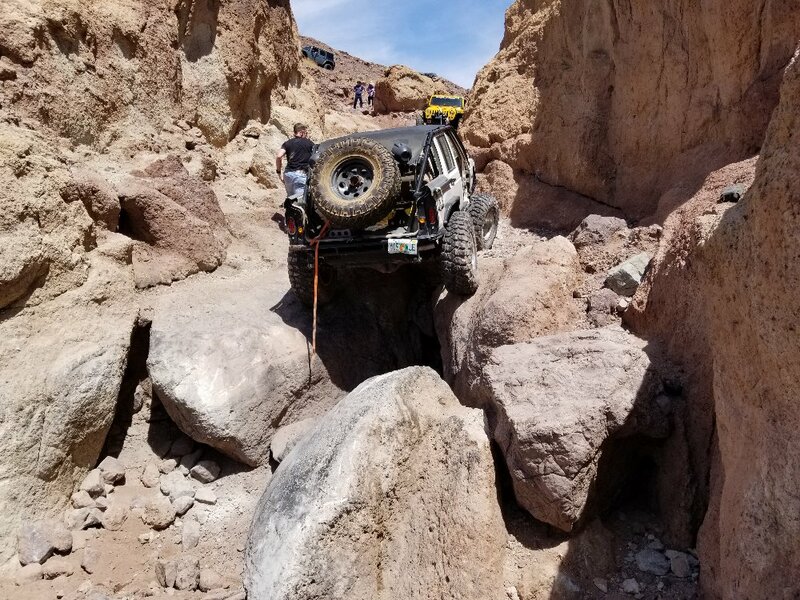 Short wheelbase Jeeps will be able to maneuver the tight obstacles better while the longer wheelbase vehicles like JKU's and Toyotas will do better on some of the waterfalls. 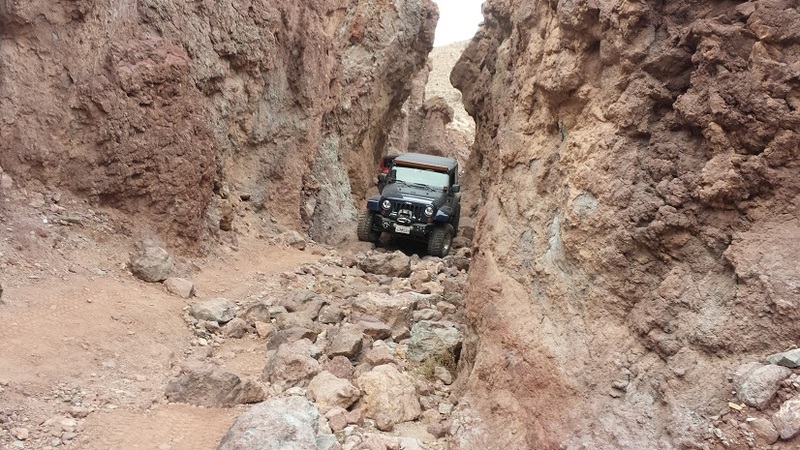 Either way, there is something on this trail that will be hard for almost any offroad vehicle. Be careful for flash floods, the area is prone to it and there is very little places to escape it. Also, please do not stack rocks in the gatekeeper, keep this obstacle a challenge for the next. If you can't do it, please take the bypass. 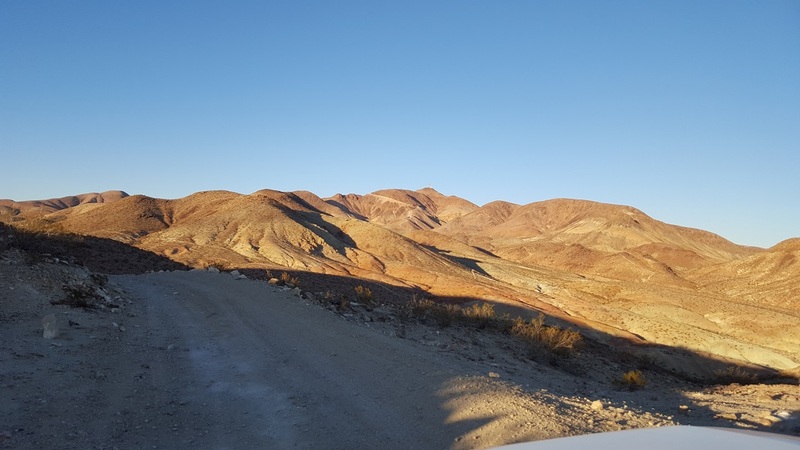 If the Gate Keeper isn't for you, then there is an alternate route to Doran Canyon that is much easier. It is easy to miss but can be found right before the Mud Arches on the west hill. The bypass around Doran Canyons Gate Keeper can be found here at Doran Gate Keeper Bypass Trail. 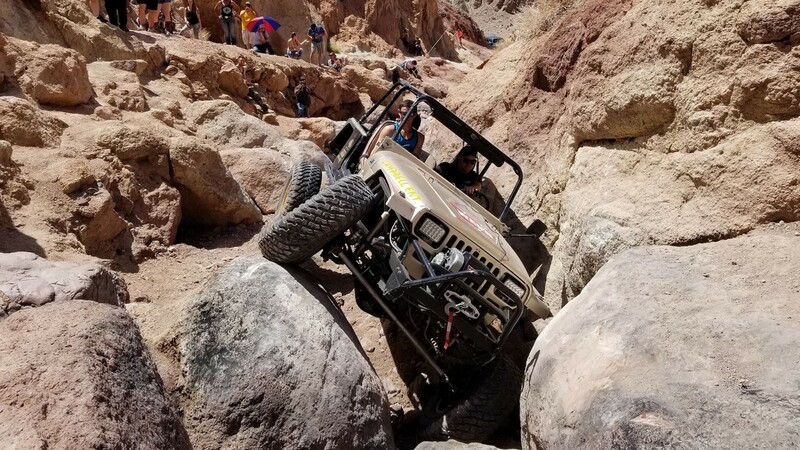 Doran's Gate Keeper is easily in the top 5 list of the hardest obstacles that a vehicle can do under its own power in the United States. 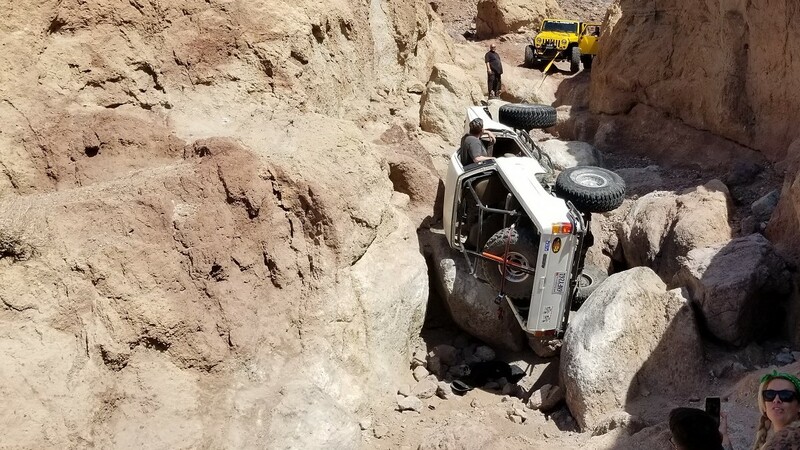 With rocks and holes larger then Jeeps, it is easy to see why the only way up is to put the vehicle on its side a few times. 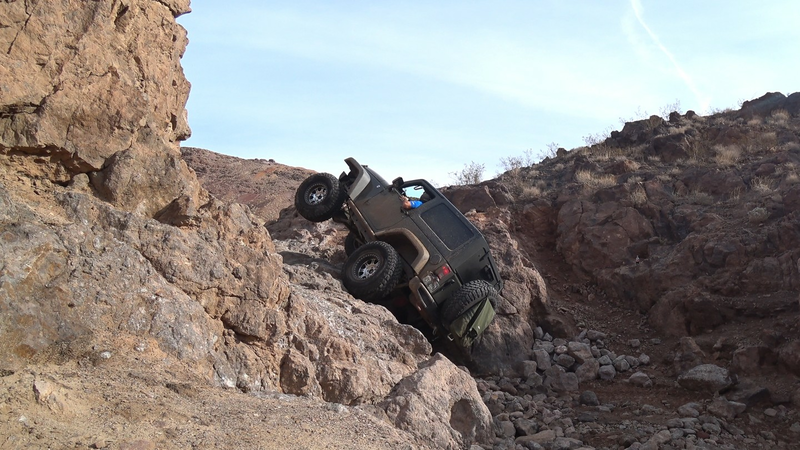 If you have a built rig, a strong roll cage, and don't care about a repair bill, then this obstacle is for you. ***DO NOT MOVE OR STACK ROCKS IN THIS OBSTACLE, IF YOU ARE UNABLE TO MAKE THIS OPTIONAL OBSTACLE UNDER YOUR OWN POWER, TAKE THE BYPASS. DO NOT RUIN THIS SPOT FOR THE NEXT PERSON. *** The bypass around Doran Canyons GateKeeper can be found here at Doran Gate Keeper Bypass Trail. Once you drop into Doran, you are introduced to your first obstacle right away. This narrow but off-camber and articulated area is a lot of fun but can also be costly on the repairs. This one section can either be easy or a nightmare. Since there is only enough space for one line, you have to hope there isn't anything you can't clear on the path. Make sure you have good under armor because there is a good chance you will use it here. Probably the second hardest obstacle on the trail, this 5 foot waterfall is a doozy. Since the wall is a near 90 degrees with sand on top, some rock stacking may be required for even the most built rigs. The trail that keeps on giving. This is the 3rd waterfall from the bottom. This obstacle offers two lines - the easy route and the hard route. The hard line requires you to navigate a vertical V notch and then make a hard left over another V notch. Be ready for the body damage because it is on its way. The trail that keeps on giving. This is the 3rd waterfall from the bottom. This obstacle offers two lines - the easy route and the hard route. The easy line (if you want to call it that) has many large 36 inch plus boulders in the path and a 4 foot waterfall that is off-camber. If you take your time and have a little help form a spotter, most vehicles can make it through without body damage. One of the larger mines in the area, the Bismarck Mine was closed (dynamited) to prevent any incidents inside. 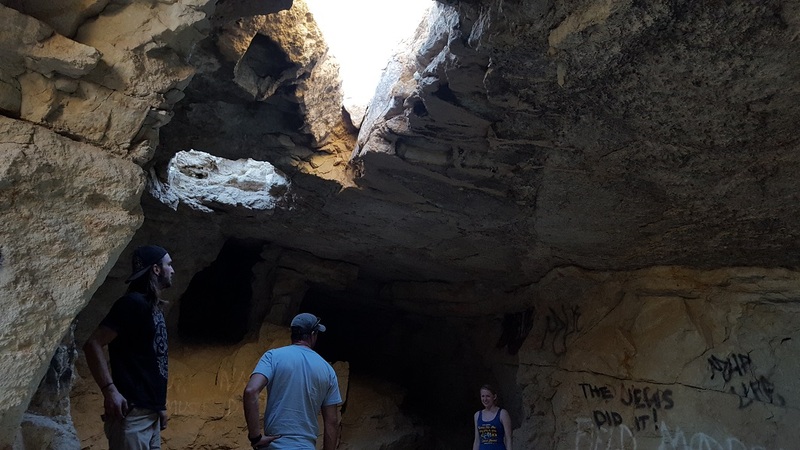 Even though it was closed, there are still plenty of areas to explore. As always with mines, travel in pairs, make sure people know where you are, and have a flashlight. On top of the hills above Doran, this spot provides a great 360 degree view of the area. 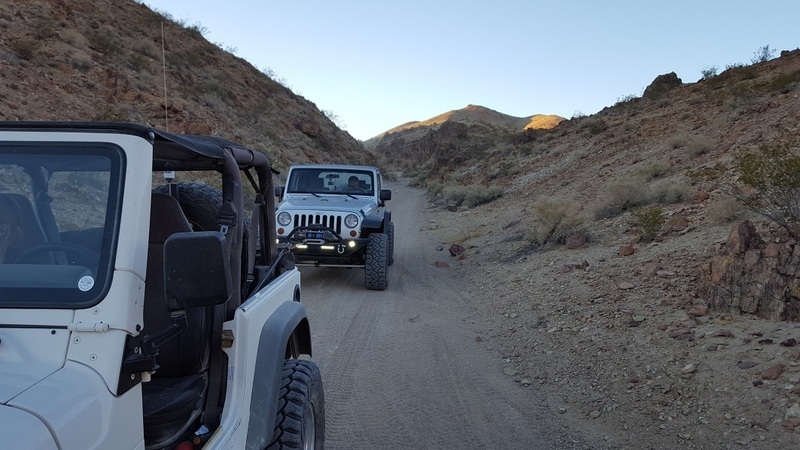 The trail connects to Odessa Canyon. From Highway 15 in Barstow, exit the second Ghost Town Road off-ramp. Take Ghost Town Road north roughly 2.5 miles passing Mule Canyon on the right. 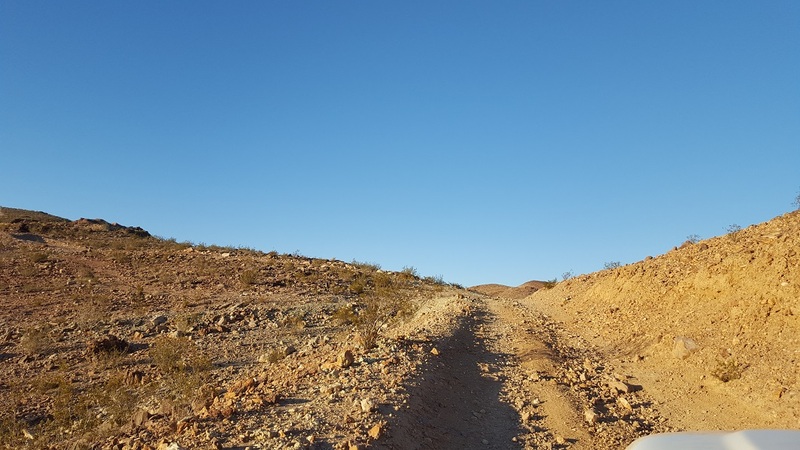 Turn right onto the dirt road (Odessa Canyon), and you will see a sign just off the road with a map (34.939767, -116.858813). 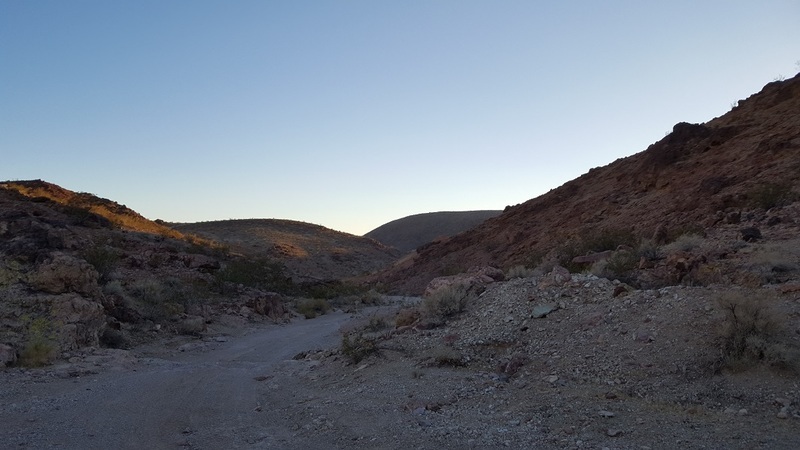 Enter Odessa / Doran Canyon and stay on the dirt road for roughly 3/4 of a mile until you reach a Y in the canyon, then go left. Please note, the canyon splits to the right. This is where you will find Odessa Canyon. 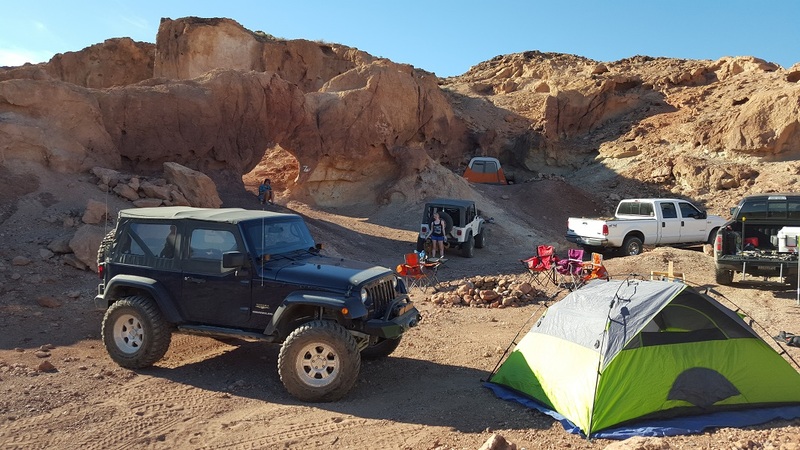 I've done this every year with Wranglerforum (the Doran-Odessa Loop) and it never ceases to be fun! 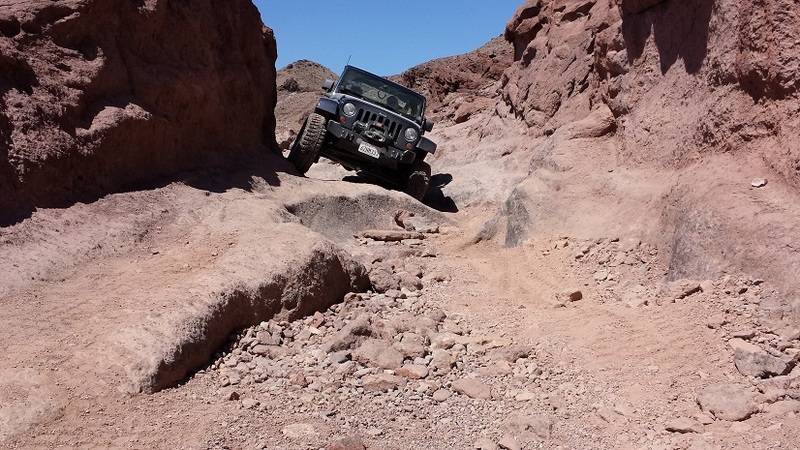 Don't try this trail without someone experienced getting through the obstacles. Also, you'll need a 4" lift, lockers, and someone in the group experienced in recovery or getting a stalled vehicle up the waterfalls. Other than that, it's a piece of cake! 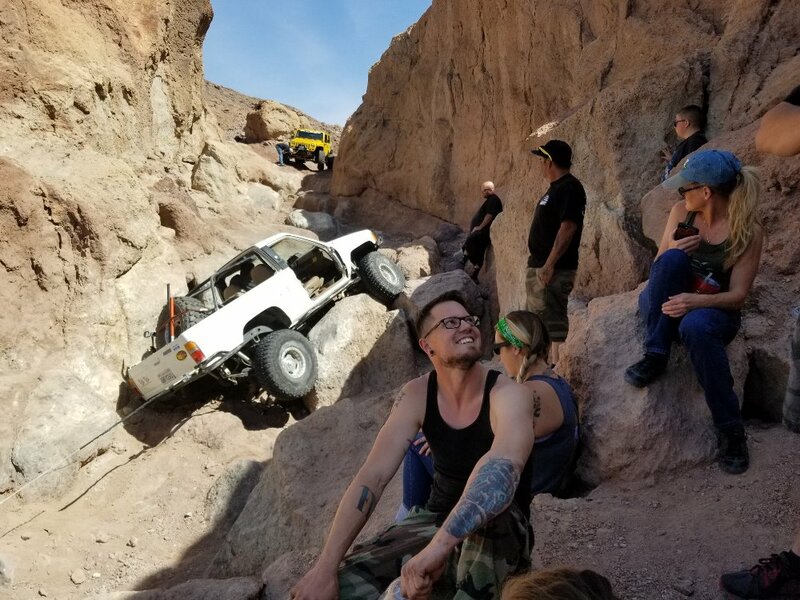 While in my opinion the risk of body damage is low, these are trails that require someone with an expert level of competence. 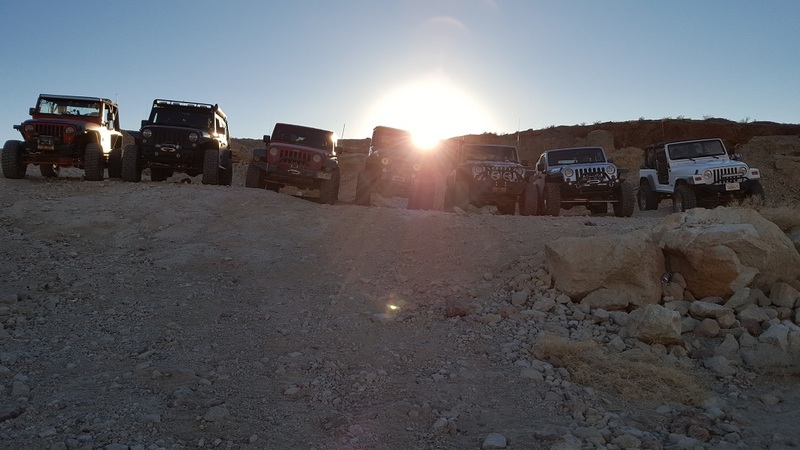 What a great trail. I really enjoyed the waterfall obstacle and the tight canyon just before it! 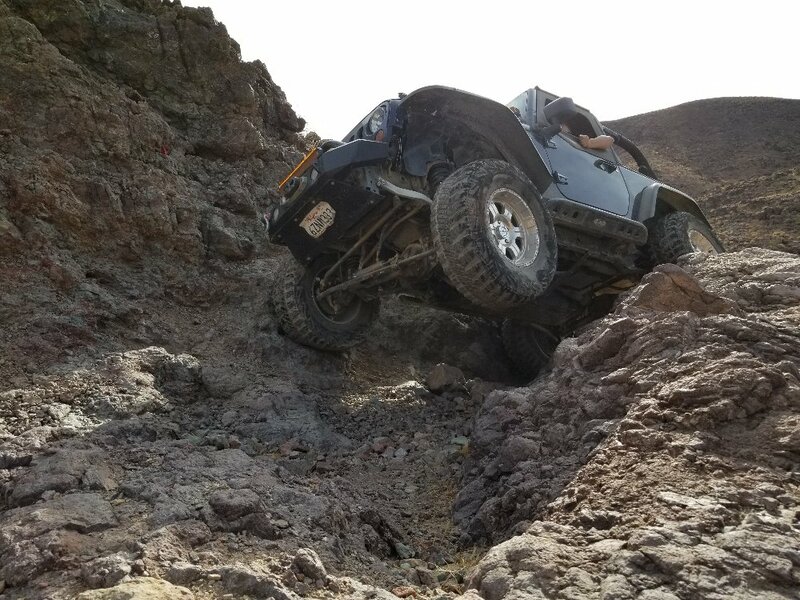 I was in a JKU with 35s and a 2.5" Rock Krawler lift and struggled at the waterfall obstacle just a bit, but it was still a blast! The Bismarck Mine was really unique with all the open tunnels - they were everywhere! First, run on this trail and what a treat. First stop was on the bypass around the gatekeeper. You can see how deep this wash is with the guy in red standing in the bottom below us. This is a challenge for even the best-built rig, would recommend a buggy because you are sure to do some body damage. Another photo shows the upper ledge of gatekeeper. 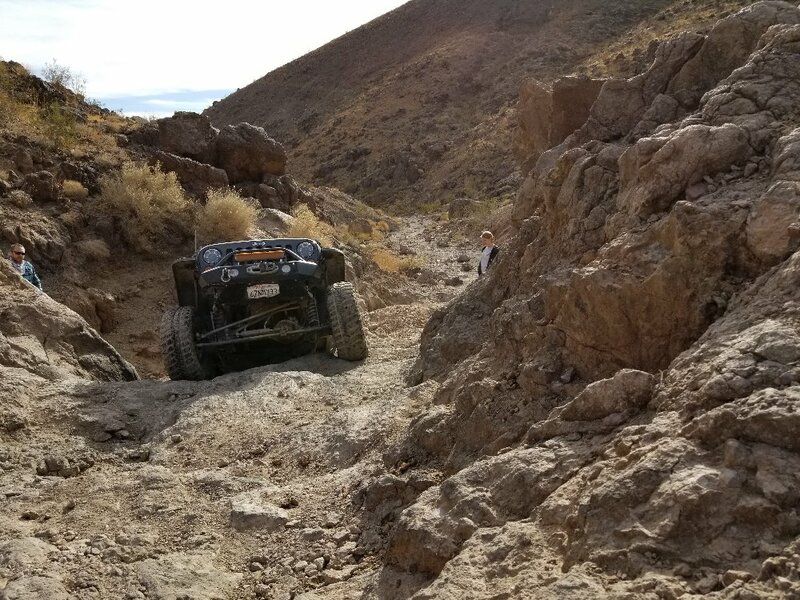 The challenges of this trail brings the recommendation of at least 1 locker, skid plates, lift, at least 33's, winch and experience. 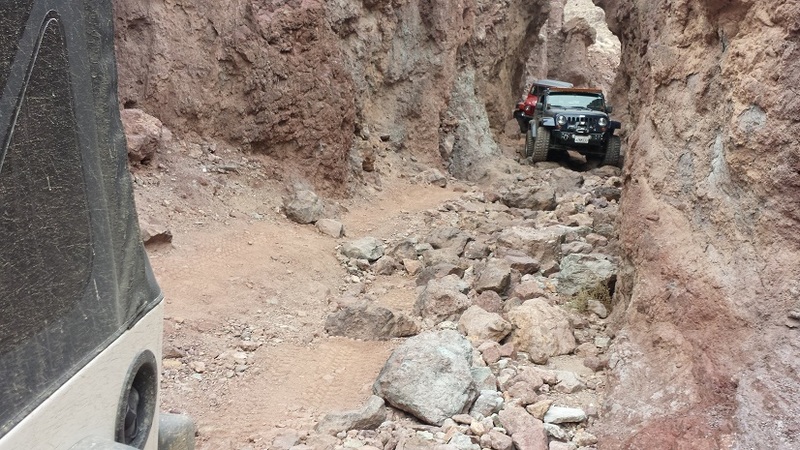 The trail is loose rock, sand, small to large boulders, narrow canyon, and waterfalls. 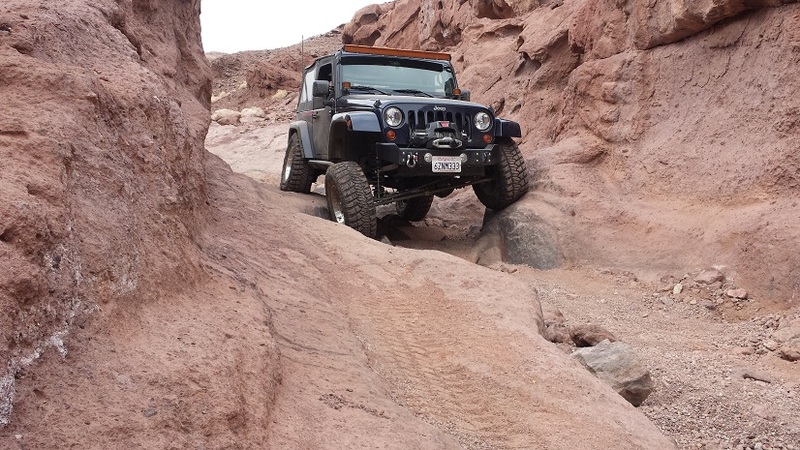 The waterfalls can be difficult to climb so the need for a winch or strap may come into play. This is a great trail but has the potential for damage. 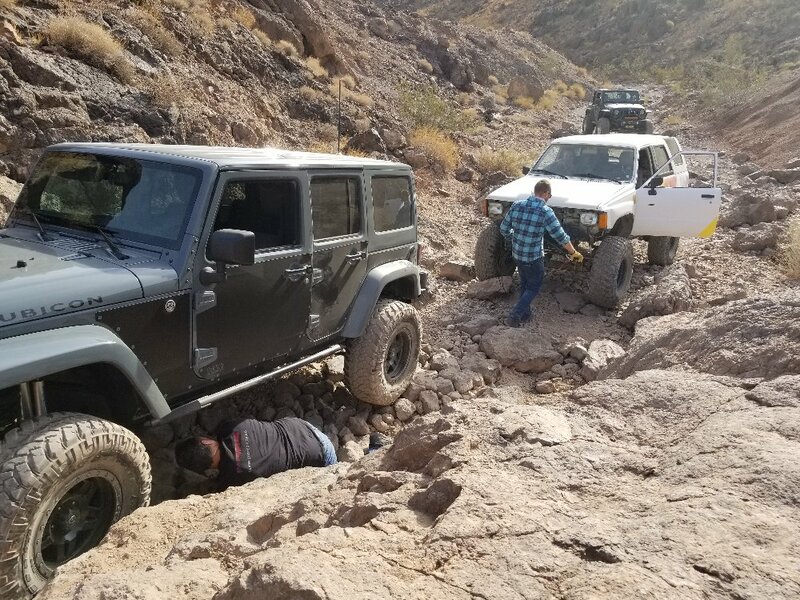 After the fun section of this trail, you'll find the mine (stay on the roads there are multiple tunnels running under you) the mine has multiple openings and if you're adventurous enough you can enter them, use caution and have a rope or something to assist in getting back out of the deeper ones. If you look close enough you might find some silver in the walls. 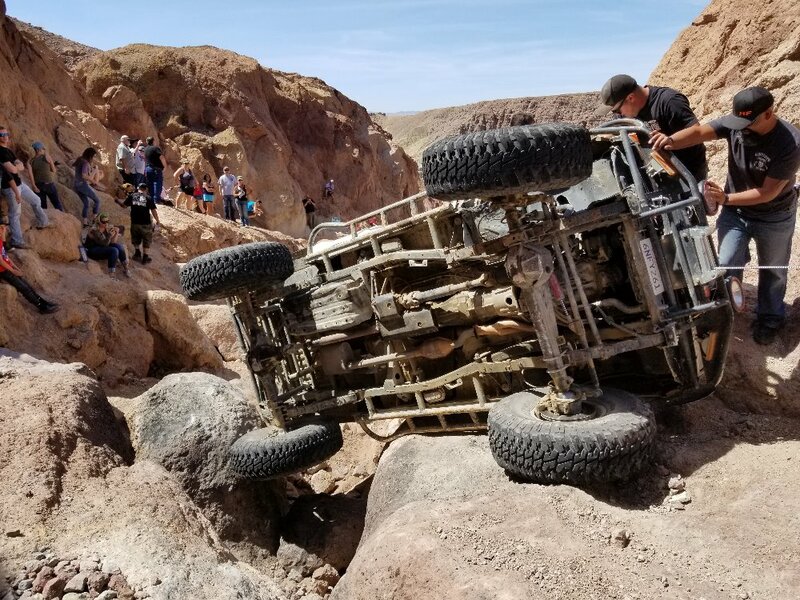 This was a first for me wheeling in the state of California and what an experience. This area is definitely unlike anything I have wheeled in before. 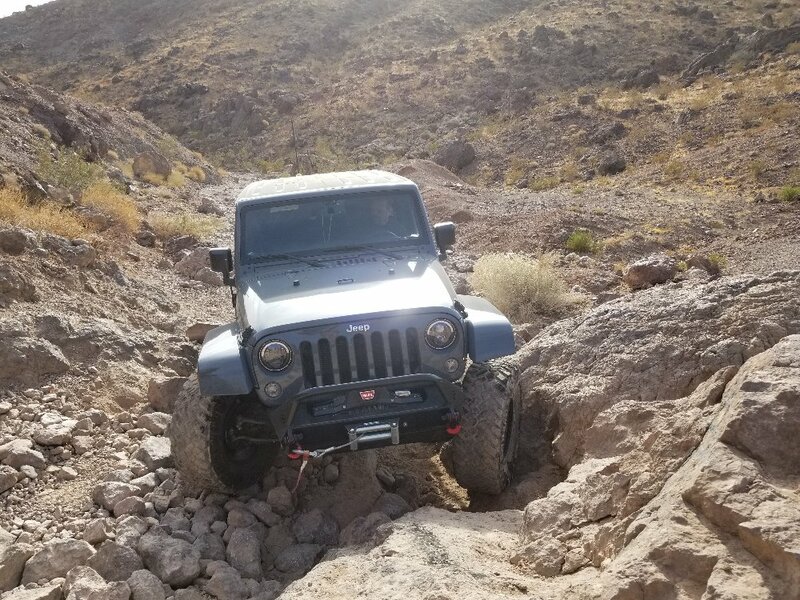 Doran Canyon was a very fun trail with many sections of larger rocks to weave around and a good amount of waterfalls to give it the extra thrill. Let's just say it was surprising that the only damage was one sidewall slash. This trail is not a walk in the park. The rock is very sharp and unforgiving making every obstacle a mental challenge as much as it challenges your rig. 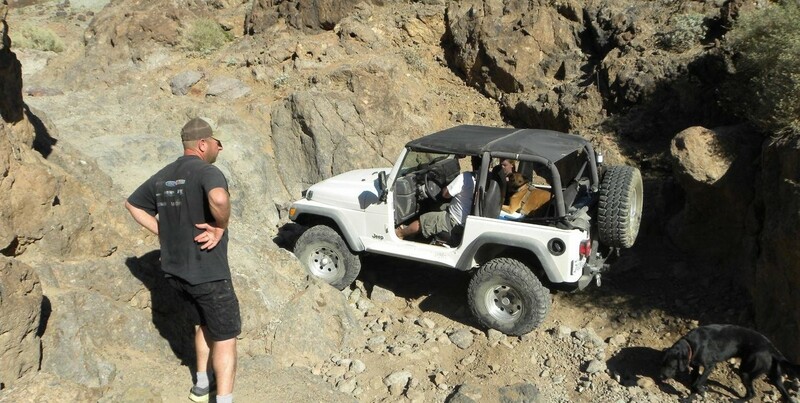 It is highly recommended that if you can't crawl up these obstacles, use your winch! 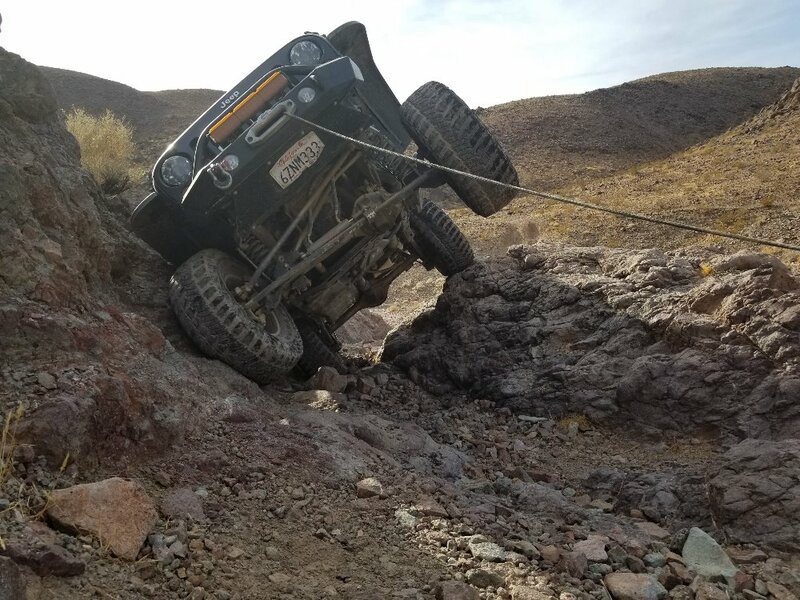 There is no shame in winching if it means saving your rig from damage. The optional challenge of the Gate Keeper looks like one hell of a ride. No one in our group was quite rigged for that 10 rated obstacle. The mines at the top were pretty amazing to see. I've seen mines, but none that you can just wander into aimlessly, some for many many yards. Be sure to bring a flashlight!